The primary objective for grid operators is to provide reliable electricity at minimum cost by purchasing electricity from the lowest cost generators and delivering it to customers. However, the configuration of the transmission lines that deliver power from the generators is often not well matched to customer locations. As a result, overloaded transmission lines can approach their thermal limits, causing network congestion and forcing utilities to purchase electricity from higher cost generators and/or curtail renewable generation. Purchasing (or dispatching) more expensive electricity sources due to transmission congestion is estimated to cost an additional $5 to $10 billion per year in the United States. This problem is expected to worsen with the changing characteristics of electrical demand and rapidly increasing variable renewable generation penetration in the electricity grid. New technologies that manage the existing resources of the grid more effectively are needed to provide the cleanest and most cost effective approach to using our power generation resources. Temporarily reducing the demand for electricity to avoid congestion, often called demand response (DR), is a powerful tool that grid operators can use to help improve reliability and reduce cost. Historically, demand response has largely been used only during anticipated “events,” with planning a day in advance, and with little or no matching of the controls to different customers, different regions, or changes in conditions over time. Furthermore, historically only large electricity customers (100 kilowatts and above) were able to participate in demand response programs because of the expense and specialized hardware and communications technologies that were required. Greater ability to tailor demand response requests based on individual customer characteristics, and greater forecasting precision are needed to fully unlock the potential of demand response technologies. Indeed, recent studies by LBNL and RMI show that DR could be more cost-effective than increasing spinning reserves or adding grid-scale storage to address contingency shortfalls or to accommodate large-scale renewable energy penetration. The deployment of utility advanced metering infrastructure (AMI) and other communications-enabled sensors in recent years has enabled utilities to collect far more detailed information on both the operation of their systems and electricity use profiles. For the first time, utilities can collect and analyze data on individual customer electricity use in near real-time. Separately, advances in software tools to collect, store, and analyze large datasets and cost-effective, large-scale, commercial cloud computing infrastructures have become more widely available. These new tools are facilitating the development of far more sophisticated data analytics and forecasting applications across a wide range of different industries, and have led to rapid advances in many areas of computer science including machine learning and optimization. The advances described on the previous page are enabling the development of a wide range of new utility-specific data analytics applications. The research community has been exploring new approaches to forecasting and dispatch of new distributed energy resources, including smart thermostats, electric vehicles, electricity storage installations etc. Under its ARPA-E support, AutoGrid, in conjunction with Lawrence Berkeley National Laboratory and Columbia University, designed, developed, and deployed a scalable software-as-a-service (SaaS) demand response optimization platform known as the Demand Response Optimization and Management System - Real-Time (DROMS-RT). The goal of the DROMS-RT software platform was to build bottom up demand response forecasts at the granularity of individual customers in presence of dynamic pricing signals or other demand response signals in near real-time. With this information, the system was also developed to manage the optimal dispatch of DR resources across large portfolios of heterogeneous demand response programs (with different enrolled customers, utility business rules, time horizons, etc.). Achieving high forecast precision for millions of individual customers in extremely short timeframes required the team to leverage recent advances in machine learning, data mining, and robust optimization. During the ARPA-E project, AutoGrid and its partners evaluated a wide range of different potential forecasting methods based on segmenting customers into different classes based on their historical response to different DR events. They developed methods to enhance the forecasts by the collection of periodic electricity usage data at individual customer locations, and to predict changes in customer load profiles using load time series of individual customers. The resulting system generates individual customer load usage and load shed forecasts (with associated forecast error distributions). AutoGrid also included compatibility with real-time DR signaling to customer devices (including thermostats and electric vehicle charging stations), and included the use of data from these devices to further increase the precision of the DROMS-RT individual customer forecasts. The system is designed to provide individual DR signals that can be sent to customers based on utility needs and the calculated individual customer demand response forecasts. The AutoGrid team demonstrated a highly parallel machine learning engine capable of processing more than one million forecasts on a rolling basis every ten minutes, performance significantly beyond industry expectations using most existing utility demand response software applications. The team also demonstrated the tool’s ability to manage many different heterogeneous demand response programs. This helps grid operators better manage unpredictable demand and supply fluctuations in short time-scales, making power system operations more efficient and cost effective for both utilities and electricity consumers. AutoGrid is a start-up company that was incorporated just before obtaining its ARPA-E support, to develop the DROMS platform. AutoGrid achieved significant initial traction with utility customers during their ARPA-E project. The platform was used to deploy commercial DR programs for more than 70,000 customers during field tests and early commercial deployments with various clients. 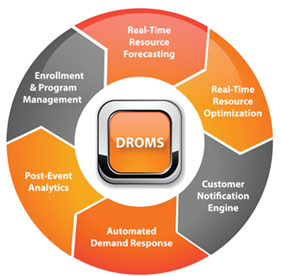 DROMS-RT is expected to provide significant reduction in the cost of operating demand response and dynamic pricing programs in the United States by eliminating up-front IT infrastructure costs for utilities, by dramatically reducing the end-point cost for customers, and by making the overall DR operations more efficient. AutoGrid has raised $21.75 million in two rounds of follow-on funding from multiple investors. The company has more than 550 MW of distributed energy resources (DERs) under contract, including combined heat and power (CHP) units, energy storage systems, smart solar inverters, HVAC systems, commercial building lighting systems, electric vehicle (EV) chargers, smart thermostats, water heaters, pool pumps, and load control switches. AutoGrid has more than 30 implementations across the globe. For example, Bonneville Power Administration (BPA) uses the AutoGrid DROMS-RT platform to implement fast and intelligent DR demonstrations, and DROMS serves as their DR command center. Recently, AutoGrid, in partnership with Eneco, deployed the first software-defined power plant in the Dutch electric grid using AutoGrid’s software technologies. Other clients include Marin Clean Energy (where AutoGrid is pioneering market integration for the community choice model), Southern California Edison (where AutoGrid powers multiple EV pricing programs), Austin Energy (the first Bring Your Own Thermostat program), Portland General Electric (behavioral DR for 70,000 customers), New Hampshire Electric Cooperative (residential Internet of Things DR), City of Palo Alto Utilities (behavioral demand response), Gexa (Texas market-based DR), and Hawaiian Electric (water heater DR to mitigate solar intermittency). Since the end of their ARPA-E project, AutoGrid has been working to extend their cloud-based platform to enable it to manage and analyze large data sets for a range of additional energy applications. 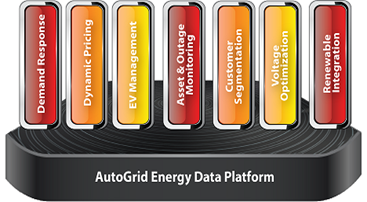 This platform, now known as AutoGrid’s Energy Data Platform (EDP), is also designed to provide big-data analytics and predictive control services to third party applications. In addition to success with customers, AutoGrid has received a number of awards. In 2016, AutoGrid was named a New Energy Pioneer by Bloomberg New Energy Finance and a winner of a Grid Edge Award by Greentech Media. In 2015, AutoGrid was named a World Economic Forum Technology Pioneer, a member of the Red Herring Top 100 North America, a member of the Cleantech 100, and a Smart Grid Company to Watch. AutoGrid was also named a 2015 finalist for both the Platts Global Energy Awards and the Circular Economy Awards. Previous awards include 2014 Green Product of the Year, Code_n Business Innovation Award at CeBIT 2014, and Greentech Media’s Grid Edge 20. New utility big data analytics applications such as the DROMS-RT system developed by AutoGrid promise to significantly improve the ability for utilities to optimize and control the grid and also promise to give customers more control over their energy usage and utility bills by providing them with up-to-date information on prices and real-time, grid-wide energy demand and supply conditions. These new tools could, over time, revolutionize data management and analysis practices for grid management and control applications. Real-time granular demand response optimization and control specifically will also improve reliability and reduce costs by enabling full demand-side participation in electricity markets. This improved flexibility will become increasingly important as renewable resource penetrations grow over the next several decades. As of February 2016, the Autogrid team’s project has generated 5 invention disclosures with ARPA-E and 5 U.S. non-provisional patent applications. “Determining Load Reductions In Demand Response Systems”. (2012) U.S. Patent Application No. 14/345391. Washington, DC: U.S. Patent and Trademark Office. “Identifying Operability Failure In Dr Assets”. (2013) U.S. Patent Application No. 14/442904. Washington, DC: U.S. Patent and Trademark Office. “Load Forecasting From Individual Customer To System Level Based On Price”. (2012) U.S. Patent Application No. 14/345235. Washington, DC: U.S. Patent and Trademark Office. “Scalable And Web-Based Dr Platform For Communication Of A Dr Signal Using A Network Server”. (2012) U.S. Patent Application No. 14/345255. Washington, DC: U.S. Patent and Trademark Office. “System And A Method For Optimization And Management Of Demand Response And Distributed Energy Resources”. (2012) U.S. Patent Application No. 14/345248. Washington, DC: U.S. Patent and Trademark Office. C. Abad; G. Iyengar, "A Near-Optimal Maintenance Policy for Automated DR Devices," in IEEE Transactions on Smart Grid, August 2015, vol.PP, no.99, pp.1-1. M.A. Piette, S. Kiliccote, H. Junqiao, Dudley, "Field demonstration of automated demand response for both winter and summer events in large buildings in the Pacific Northwest", Journal: Energy Efficiency 2013. S. Kiliccote, S. Lanzisera, A. Liao, O. Schetrit and M.A. Piette, “Fast DR: Controlling Small Loads over the Internet”, ACEEE Summer Study on Energy Efficiency Buildings, August 2014. V. Goyal, G. Iyengar and Z. Qiu, "Near-optimal execution policies for demand-response contracts in electricity markets," Decision and Control (CDC), 2013 IEEE 52nd Annual Conference on, Firenze, 2013, pp. 3697-3702. V. Goyal, G. Iyengar, Q. Schwarz and S. Wang, "Optimal price rebates for demand response under power flow constraints," Smart Grid Communications (SmartGridComm), 2014 IEEE International Conference on, Venice, 2014, pp. 626-631. David S. Watson, Nance Matson, Janie Page, Sila Kiliccote, Mary Ann Piette, Lawrence Berkeley National Labs, “Fast Automated Demand Response to Enable the Integration of Renewable Resources”, Report LBNL-5555E, June 2012. Peter Bronski, Mark Dyson, Matt Lehrman, James Mandel, Jesse Morris, Titiaan Palazzi, Sam Ramirez, Hervé Touati. Rocky Mountain Institute (RMI), “The Economics of Demand Flexibility”, August 2015. Such as Hadoop (http://hadoop.apache.org) and NoSQL database like HBase (http://hbase.apache.org).